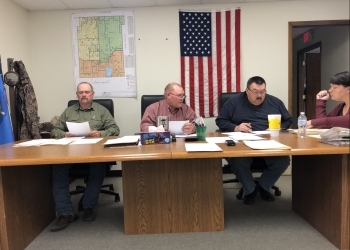 Talks about replacing the fire alarm system at the courthouse took the forefront of the discussion at Monday morning’s meeting of the Nowata County Commissioners. Commissioner Troy Friddle stated that he spoke with the state fire marshal about getting the fire detection system up to date. Friddle says the sytem needs to be updated to keep the jail ond courthouse building open. An estimate of the total cost of the system would be less than $50,000, according to Friddle. Undersheriff Mark Kirschner spoke on the plumbing issues at the jail. Kirschner said no one has fixed any of the sink or toilets yet. Also, Kirschner said the sheriff’s department is operating with one vehicle with four-wheel drive capabilities which creates challenges in responding to rural calls. In other business, an item regarding updates to the county handbook was tabled once again. Representatives from several county offices want to have more time to look over potential changes. No updates have been made to the handbook since 2013.